This ghost cannot wait for the witching hour to come out and make his Halloween debut. You can create this spooky character with a cookie cutter, felt and fringe yarn. Craft Patterns: Use the ghost template here if you do not have a cookie cutter with a ghost shape. 1. 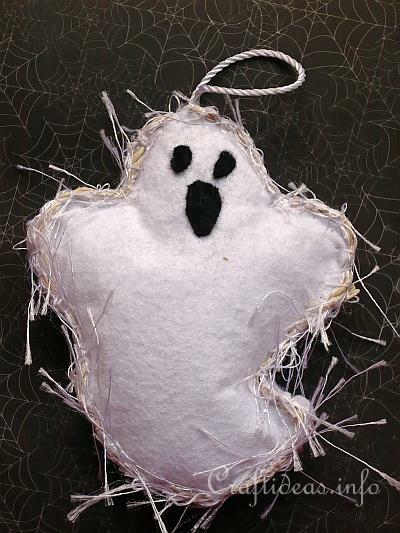 Trace the ghost shape twice onto white felt and cut out. 2. Place the wrong sides facing each other (the right sides are on the outside) and begin to sew using blanket stitch. While sewing, carry the fringe yarn along with the thread. You are sewing with the thread to sew the ghost together and at the same time using the thread to sew down the fringe yarn in place along the edge of the figure. If necessary, when finished, you may need to pull the fringe out from under the thread so that they stand out more. 3. 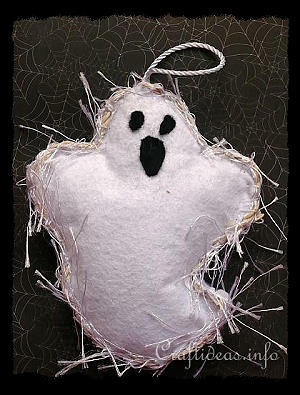 Before finishing off your ghost, stuff it lightly with fiber fill. 4. Cut a piece of cord and create a loop. Sew it to the top of the head. 5. Cut two black felt eyes and a spooky mouth and sew these onto the ghost using a few stitches.